Olanzapine, known by the brand name Zyprexa, is an antipsychotic medication used for treating the psychiatric conditions of schizophrenia and bipolar disorder. The National Alliance on Mental Illness notes that this popularly prescribed medication aids in managing symptoms such as hallucinations, delusions and mood disturbance associated with mania in bipolar disorder. Although olanzapine is deemed as highly effective in treating these psychiatric conditions, there are possible adverse effects to long-term use. The side effects of long-term use are reportedly so significant that class action lawsuits against the manufacturer of the medication are ongoing. Problems associated with use of this drug include development of blood sugar disorders, movement disorder and weight gain. According to the U.S. Food and Drug Administration, long-term use of Zyprexa may result in the development of blood sugar disorders such as hyperglycemia and diabetes. 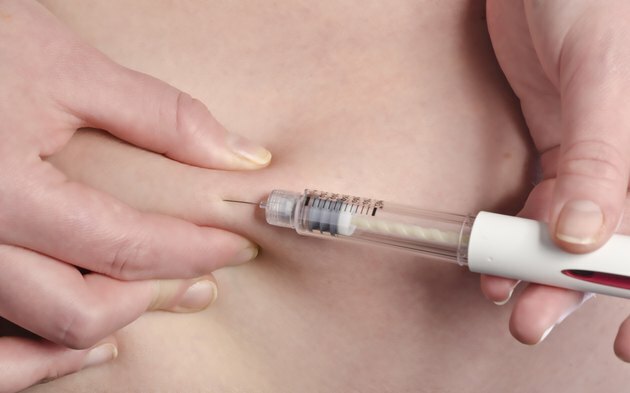 These conditions occur when the body cannot properly produce or use naturally occurring insulin. The Mayo Clinic explains that olanzapine increases the amount of sugar in the blood. Symptoms of increased thirst and urination signify possible blood sugar disorders. Consult a physician to test for blood sugar changes if symptoms appear. According to "Psychiatric News," long-term use of Zyprexa is associated with insulin resistance, which complicates the metabolic process regulating the ability of the body to utilize glucose. Chronic insulin resistance can lead to hypertension and cardiovascular disease. The Mayo Clinic notes that long-term use of Zyprexa increases weight. The FDA reports on average, study trials concluded that clinically significant weight gain was associated with use of Zyprexa. Although the amount of weight ranges depending on the individual, the effect is significant enough to warrant concern due to overall health implications. Concerns with cholesterol and fat increase are further associated with use of Zyprexa, which impacts body mass and weight. Common to many antipsychotic medications is the development of tardive dyskinesia, which affects movement. This condition is significant over time in users of Zyprexa and essentially becomes uncomfortable involuntary movements. The National Alliance on Mental Illness explains that symptoms include restlessness, uncontrolled arm or leg movement, and lip smacking. Another condition of a more serious nature referred to as neuroleptic malignant syndrome is reported in users of Zyprexa. The FDA notes that this condition is life-threatening and characterized by sudden high fever, extreme changes in blood pressure, and liver or kidney function problems. Neuroleptic malignant syndrome often progressively develops over the course of using this medication.